The modern parish of Cringleford is southwest of Norwich and northeast of Hethersett. A suburban village occupies much of the east and the A11 Norwich to London road passes through its centre. This major trunk road meets the A47 Norwich Southern bypass in the west. There is arable land in the north and east and marshes in the east. The eastern boundary follows the River Yare and the southern boundary a tributary of the Yare. A lot of archaeological work has been carried out in Cringleford. Fieldwalking and excavations have taken place in a number of locations ahead of road constructions, car park laying and building works. Many fields have been fieldwalked and metal detected, there have been plenty of site visits and several geophysical surveys have been completed. Numerous stray finds have also been reported. Sites are located throughout, with only a few areas having none at all. Prehistoric flint artefacts have been discovered throughout. They include two Palaeolithic handaxes, two Neolithic flaked axeheads, a Neolithic harpoon barb, Neolithic arrowheads, a Neolithic polished axehead (NHER 9355) and a Neolithic or Bronze Age polished axehead. Five Bronze Age copper alloy objects are recorded; they are three socketed axeheads (NHER 16229), a palstave and a flat axehead. In 2004 undated ditches, pits and post holes were found during an evaluation excavation at the site of a proposed new school. These features may have been prehistoric. Four possible Bronze Age barrows have been identified in the parish. One may survive (NHER 9359) in the grounds of Cringleford Hall and pottery may have been recovered from it during the early 20th century. The second (NHER 9360) was recorded on a 19th century map, but its site is now beneath modern housing. The third is a low mound (NHER 9395) located in the west. During the late 18th century and early 19th century a large quantity of human bones (NHER 5008) was discovered in the south. They may have been buried in the fourth possible barrow, although it is possible that they were associated with a ruined stone building observed in 1800. This building could have been the unlocated medieval chapel that is recorded in the parish. Iron Age pottery has been found at sites in the south and the centre. In 1986 a gold coin minted during the 1st century BC was found in the west, where an undated enclosure or field system is visible as cropmarks on aerial photographs. The coin could suggest a date for the cropmarks, although so could the Roman, medieval and post medieval artefacts discovered at the site. A coin made in continental Europe and dating to the 3rd century BC has also been found in the parish, although where is not known. Roman objects recovered include pottery fragments, coins, a finger ring, a patera and a surgical instrument. Two possible coin hoards are recorded, although where they were found is unknown. In 1835 workmen collected about 100 coins and human bones from Roman or later burials (NHER 9362). The second hoard (NHER 9363) was discovered in the 1920s 'outside Norwich', probably in Cringleford. In 1930 a Roman cremation pot (NHER 9364) was found in a garden in the centre. Objects of Saxon date include an Early Saxon brooch, an 8th century coin, Middle and Late Saxon disc brooches, a Late Saxon bridle cheekpiece and Late Saxon pottery. Cringleford is called ‘Kringelforda’ in the Domesday Book of 1086. This hybrid Old English/Old Norse name means ‘ford by the round hill’. In 1086 the Bishop of Bayeux, Count Alan and Roget Bigot held land in the parish. The estate of the Bishop of Bayeux was linked to land in Bramerton. Freemen, smallholders, villagers, ploughs, meadows and mills were recorded. St Peter’s Church (NHER 9369) stands in the centre east of the village, west of Cringleford Bridge. The nave and chancel date to the 11th century and during the 13th century a north chapel or aisle was added. The tower may date to the 14th century. The whole church was restored and a new south aisle was added in the late 19th and early 20th centuries. 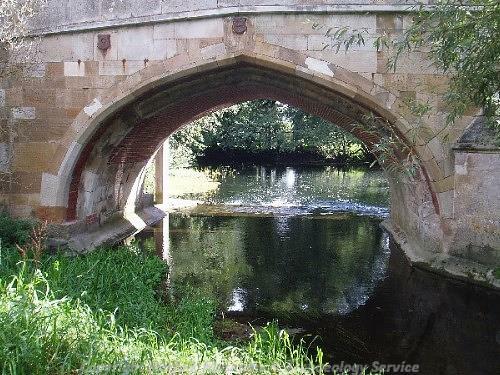 In the south, close to the tributary of the River Yare, is a medieval moat with wide water-filled arms. It may have been abandoned during the 17th or 18th centuries when the nearby 16th to 17th century Cringleford Hall (NHER 11610) was increased in size. The central island is quite marshy; the water table may have been altered in the post medieval period to allow the island to be used as a garden. Cringleford Bridge was built in 1520. Medieval bricks and stonework survive in at least two arches, abutments and the central pier. It was widened in the late 18th century and restored during the 1970s. A timber bridge on the site was destroyed in floods in 1519. To the west of the church is the site of a medieval manor house (NHER 15914) demolished during 19th century road widening works. In 1999 an excavation revealed medieval pits in an adjacent area. Pond Farmhouse (NHER 11612) also stands close by and is an extended medieval hall house. In 1589 it survived a fire that destroyed most of Cringleford and was probably added to soon afterwards. Cringleford appears on Faden’s map of 1797 as a small linear village located alongside the Norwich to Wymondham road. A windmill (NHER 15550) is shown is to the north. Surviving post medieval buildings include Ford End House, The Vicarage, Cringleford House/Roseland House, Jewson’s Barn and The Roundhouse. A water mill is marked on a map dating to about 1570. This may have been the building that was rebuilt during the 18th century and that burnt down in 1916. The surviving mill house dates to 1795, although it incorporates earlier brickwork. In the west of the village is a water pump (NHER 34058) that was cast in 1835 and erected for the Norwich and Thetford turnpike trust. It was moved from its original location in 1974. Medieval and post medieval artefacts have been found throughout. They include pottery, coins, tokens, a 13th century papal bull, a medieval cannon ball, a gun flint and a post medieval wig curler. Part of a medieval pottery kiln has been found near the church and in 1976 a scatter of post medieval kiln debris and pottery wasters was found in a field in the northwest. A follow-up geophysical survey suggested the locations for three possible pottery kilns. It is interesting that 17th century documents mention a potter using the latter site and that there are records of potting clay being exported from Cringleford to Holland. Over 100 sherds of pottery found during fieldwalking to the southeast of the site could be debris from another pottery kiln. David Robertson (NLA), 31 March 2006.
http://www.norfolkmills.co.uk/Watermills/cringleford.html. Accessed 3 April 2006.
http://www.norfolkmills.co.uk/WindmillsN/cringleford-postmill.html. Accessed 3 April 2006.